St. Nicholas's church was founded in 1101, by Herbert de Losinga, allegedly as part of a penance for buying the bishopric of Thetford (Ecclestone, 1959, 70). The church replaced an earlier chapel dedicated to St. Benet. The location of the earlier chapel is unknown, but is detailed as being on “Green Hill”, about half a mile north of the current church (Manship, 1854, 32). It is interesting to note that while Manship states that the chapel was constructed in 1101 (Manship, 1854, 32), and the church started in 1123, this is contradicted by most other sources (e.g. Palmer, 1856, 112, Ecclestone, 1959, 70, Pevsner and Wilson, 1197, 494). The building of the church of St. Nicholas caused some friction with the Barons of the Cinque Ports, who claimed precedence over the Yarmouth sandbank, and brought their own priest with them. The resultant quarrel was only resolved by the intervention of King Henry I (Manship, 1854, 32). The building was enlarged several times, in the late 12th century, in the 13th century and in the 14th century. The church was part of St. Nicholas’ Priory, which was a satellite of the Chapter of Norwich (Pevsner and Wilson, 1997, 504). Despite the building falling into ruin, the removal of the one arcade and the collapse (and subsequent rebuilding) of the eastern end of the church, it remains the largest parish church in England. St. Nicholas's church was badly damaged by firebombs during the Second World War, and rebuilt in the 1950s and 1960s (Pevsner and Wilson, 1997, 494). The churchyard has been enlarged several times since it was originally enclosed. Faden’s map of Yarmouth, drawn in 1797, shows the original graveyard: 1.4 hectares (3.4 acres) enclosed by Northgate Street to the west, the town walls to the north and east and St. Nicholas Priory to the south. However, in 1811, parts of the priory and the town wall were demolished to make room for an extension to the graveyard. It was extended again, in 1833, taking the limit of the churchyard as far as Factory Road. The Old Cemetery was opened in 1855, and the New Cemetery in 1875. As the oldest building in Great Yarmouth, the level of the doorway to the church probably represents the ground level in 1101. The ground level inside the walls in Great Yarmouth has built up several metres over time, including inside the churchyard. however, the modern ground level is not the accumulation of several hundred years: the ground level in the churchyard was lowered by 1.2m (4 feet) in 1883. 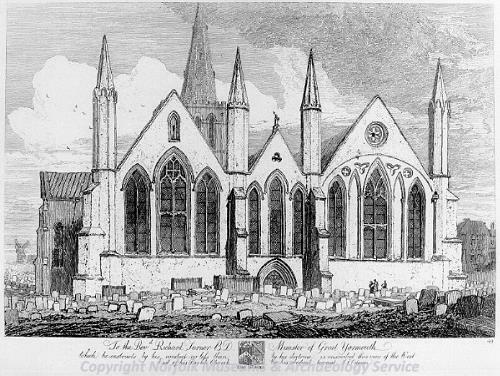 Evidence of the built up ground level can be seen at the West wall (alongside Northgate Street), along the North wall of the churchyard and in this drawing by John Sell Cotman. The Victorian restoration still leaves 1.8m (6ft) of made ground on top of the natural sands. The town walls had an associated ditch running just outside the town, to act as a moat. Archaeological investigations in the churchyard have not picked up any trace of the Medieval ditch inside the churchyard (although it has been detected elsewhere along the wall). The Civil War period moat (shown on Faden’s map) was detected during the investigations of the Great Yarmouth Archaeological Map as a layer of clay and reeds overlying the natural sand.